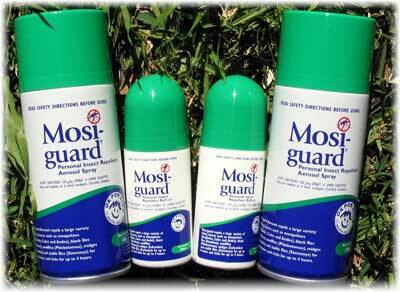 Mosi-guard is the number one selling natural insect repellent. It is one of the most effective ways of protecting yourself from biting insects. The active ingredient of Mosi-guard is Citriodiol®, a naturally occurring extract of lemon eucalyptus oil. Mosi-guard is the world's most widely used and successful natural insect repellent. It comes in two presentations, each offering the same level of protection - it is your choice which method of application you wish to use. Mosi-guard is available in aerosol spray can and a roll-on, both provide protection for at least 6 hours but even longer under field conditions. This is easily superior to all other natural repellents & is equivalent to, or better than, all synthetic repellents. Highly effective natural insect repellent. Mosi-guard is the number one selling natural insect repellent. It is nature's most effective way of protecting yourself from biting insects such as mosquitoes, sandflies, ticks and midges. Mosi-guard also protects against leeches. Use Mosi-guard in all areas where malaria is present. It is registered for use in children aged 3 months and over in the UK. The natural ingredient in Mosi-guard is Citriodiol ®, a naturally occurring extract of lemon eucalyptus oil that provides powerful and effective protection for over 10 hours in field studies. Unlike chemical based repellents Mosi-guard can be used on all members of the family including small children and will not damage plastics or synthetic fabrics. Mosi-guard is DEET-FREE so it won't dissolve or damage your sunglasses or expensive synthetic garments like horsewear, swimwear, sportswear, fishing gear or even your golf club grip. Mosi-guard has become the world's most widely used and successful natural insect repellent. Mosi-guard has been extensively tested in laboratories of the London school of Hygiene and Tropical Medicine and under field conditions in many insect-infested areas including Tanzania, jungle areas of Malaysia, Thailand, Bolivia and many more locations. Mosi-guard is produced from natural and renewable resources. Mosi-guard comes in two presentations, each offering the same protection - it is your choice which method of application suits you best. Aussieguard Natural Products, the makers of Mosi-guard, say the results of new research are further proof that it is equal to insect repellent containing 50 per cent DEET. They add that using Mosi-guard has important advantages over DEET-based products. The study*, completed at the London School of Hygiene and Tropical Medicine, confirms that Mosi-guard gives total protection from biting mosquitoes for over 10 hours. Chris Curtis, Professor of Medical Entomology at the School, who conducted the research with a team from Mahidol University in Bangkok. said: " Mosi-guard, derived from lemon eucalyptus gave more than 10 hours protection . Such a long period of repellency should make it very reliable for protection from malaria and nuisance mosquitoes for as long as a person would require it in any practical situation before going to bed under a net." Dr Paul Clarke, director of MASTA (UK), which developed Mosi-guard in collaboration with the London School of Hygiene & Tropical Medicine, said: " Mosi-guard has a pleasant lemon smell and no adverse effects on plastic, varnishes or clothes. DEET is a strong solvent chemical which can damage the plastic finish on cameras, sunglasses and other valuable equipment, as well as staining clothes. " He added: " Tests show little Mosi-guard is absorbed through the skin while up to 77 per cent of an applied dose of DEET to the palm is absorbed over 24 hours." " After the Gulf War the American Institute of Medicine commented that 'studies are needed to resolve uncertainties about whether DEET and (the insecticide) permethrin have additive effects'. The concern being that DEET may enhance the absorption of other toxic substances across the skin." " * The studies have yet to be done. Until they are it is probably wise to advise consumers not to handle any potentially toxic substances while using DEET." Dr Clarke concluded: " This authoritative new study confirming that Mosi-guard is as strong as DEET in repelling insects means that, with its benign toxicological profile, pleasant smell and no solvent action, consumers can be offered Mosi-guard as a true choice between a naturally derived and a synthetic chemical insect repellent." • The study is entitled "Efficacy of repellent products against caged and free flying Anopheles stephensi mosquitoes". • The study team included Chris Curtis, Professor of Medical Entomology, London School of Hygiene and Tropical Medicine, Yuwadee Trongtokit and Yupha Rongsriyam, Dept of Medical Entomology, Faculty of Tropical Medicine, Mahidol University, Bangkok, Thailand. • Mosi-guard contains a refined blend of lemon eucalyptus oils which maximises the insect repellent effect of lemon eucalyptus. It is much more effective than all other previous citronella-based repellents (which only provided short acting protection and had high rates of skin reactions). Mosi-guard is produced from renewable sources. It has been clinically proven in extensive testing to be the most effective natural insect repellent on the market. Mosi-guard is " safe for kids ". It is recommended for use on the whole family, including children aged 12 months and older.